Bach holiday home, 3 Bdrs, 4 Bathrooms, sleeps 8, amazing beach mountain view. 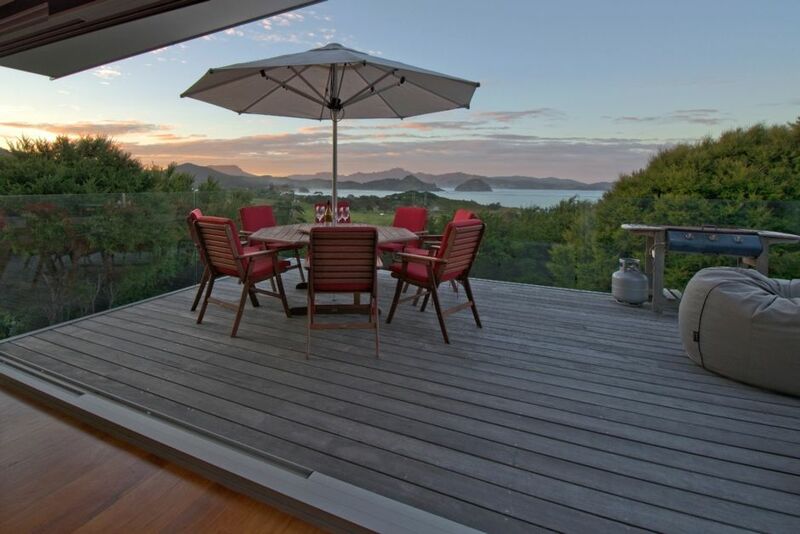 Has amazing, unobstructed North-facing 270 degree views over Medlands beach, bay and mountains beyond. Just a few minutes walk to spectacular Medlands beach via road or a bush track. The entire house is eco friendly with drinkable rain catchment water and solar panels providing all electrical power. The kitchen has a large fridge freezer with gas stove and hobs, and a massive concert island bar. Pedestrian access via foot bridge (from camp ground) across stream and then an eight minute walk to the house. Vehicle access to all houses requires crossing of this Oruawharo tidal stream at low tide!!! A 4WD vehicle is required, but what I include is a 4x4 Toyota Hilux on opposite side of foot bridge to be used free of change (exclusively on this side only) during your entire stay for transporting passengers and luggage to the house. There's a meet and greet at the food bridge to exchange car keys and unlock the house. All meals are self-catered therefore if you want specialty items it is suggested you bring these with you to the island although there are shops and cafes located at Claris, Tryphena and Port Fitzroy if you have your own transport. Barrier is an amazing destination with world-class surfing, fishing and diving on your doorstep. The southern end of Medlands beach is suitable for boat launching. Phone/ Internet / Laundry facilities are located at Claris adjacent to the general store. Mount Hobson summit, Kaitoke natural hot springs and historic kauri dams are worth the walk. No pets allowed at all. Smoking only outside. Not to be used as mass gathering for big groups and parties. The million dollar view, you want find anything else like it on the Barrier. Unbelievable sea and mountain views, 5 min walk to beautiful white sandy Medlands beach. Barbecue is located on the front deck overlooking the sea views, best cooking spot in the World. toilet, shower, View of beach and sea from shower. Top end fit out, tops made from solid New Zealand native rimu timber with Spartacus stone sinks, tilled floors. Open wood fire with granite hearth. At house or plenty across the creek or both sides of foot bridge. Hotspot to your mobile phone only. Bathroom towels provided. Turkish beach towels provided. Open plan dinning/living with wood fire and large TV. Moka Pot or Bialetti type. Large kitchen with gas stove and hobs. Fridge/freezer, coffee making area, massive concert island, plenty of room to spread out. Coffee table inside seats eight, two however sitting on bean bags. Kitchen Island breakfast bar seats four. Outdoor dinning table seats eight. 65" Sony wall hung. Sky free view channels, and DVD player. Selection of kids and adult DVD's. Patio court yard area with grass. One balcony off studio bedroom. Both bedrooms in main house have balcony/desks. Five decks, located off bedrooms and main living dinning area. Main deck has gas BBQ. Grass driveway access to main house. This place is for all types, adventurous, romantic couples, families looking for a get away from the stresses of normal life. This is my sanctuary and place of soliditude, you will be totally relaxed and feel recharged, nobody ever wants to leave and always come back, it's a true adventure with new memories. Very comfortable and well equipped house. The view of the beach and distant ranges from the main room and deck is spectacular. While there is no dining table inside there is a four seater bar and a large table on the deck that easily seats 8 people. The outside dining option is weather dependent. The kitchen is very well sit up for cooking large family meals. Use of the dishwasher and clothes washing machine would be useful for large family groups staying a week or more.